Last evening was the finals of the NCAA tournament (a good game, too; I’m watching while I finalize this article). But that wasn’t the sporting event of the day that I was most looking forward to. For me, yesterday was about Opening Day for Major League Baseball. Like much of America, I like watching my sports teams (New York Mets, Rangers, and Giants). I also, obviously, enjoy smoking cigars. So I naturally pair the two frequently. 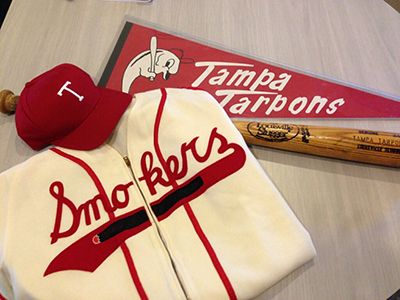 We’ve written before about the wonderful pairing of baseball and cigars. We’ve interviewed legendary Cuban pitcher and cigar smoker Luis Tiant. My colleague and I even petitioned to allow cigar smoking in the old Nationals RFK Stadium. At the time of our petition, there were frequently completely empty sections in the upper deck of the huge multi-purpose stadium. So why not allow cigar smoking in one of them for just one night? What would be the harm? We even got a local cigar shop to provide cigars for a giveaway. As you might have guessed, the Nationals disagreed. A few Major League ballparks do allow cigar smoking in special cigar bars. Comerica Park in Detroit has the Asylum Cigar Bar. Tropicana Field in Tampa has the Cuesta Rey Cigar Bar. Pittsburgh’s PNC Park used to have a cigar section. But a few cigar bars in the ballpark aren’t why baseball and cigars are a natural pairing. I have two theories for the connection. First, baseball season is also cigar season. Running April to October, it’s prime cigar smoking time, in a way that no other major sports season is. Opening Day signals spring is officially here and summer isn’t far off either. Some days may be uncomfortably hot, depending on where you are, but the cooler evenings, when most MLB games are played, are prime cigar time. The other aspect of baseball that’s so perfect for cigars is the pace. Some people complain that baseball is too slow. When you’re following a game you care about, though, it isn’t slow or boring. Just deliberate. Take a draw between batters or pitches, then sit back, exhale, and watch the action. Need to freshen your drink, check your email, or use the facilities? Put your cigar down and take care of business. Your cigar will still be lit when you get back for the first pitch of the next half inning. So here’s to another baseball (and cigar) season, full of lots of wins and fine smokes. While I agree that baseball and cigars go together like peas and carrots, the cigar season also runs right into golf season. There are few things better than lighting up a stogie and following a professional golfer as they play a round. Added bonus: nearly every golf course will allow you to enjoy a cigar while you watch. Win-win. Agreed. Golf and cigars go perfect too, though I’d almost always prefer to play golf than watch. Some may say it is like flying too close to the sun on wings of pastrami but what you should do is go for the trifecta: on more than one occasion I’ve walked 9 holes of golf, while smoking a cigar and listening to a Mets game streaming through my phone. Win-win-win. It’s no coincidence that golf and baseball are the only two sports where players use tobacco while playing. Of course for baseball it is just chewing tobacco while for golf cigarettes and cigars are sometimes seen. Baseball’s pace makes it a perfect fit for radio. And for enjoying a cigar. I’d urge any fan who isn’t a radio listener to tune in to his or her favorite team, light up and experience a wonderful time.